Published on October 24, 2017 in general info and style. Closed Tags: Cape Cod condo sales, Cape cod real estate sales, Provincetown luxury homes, Provincetown new construction, Provincetown real estate. 48 Harry Kemp Way #3 is a two bedroom, three bath condo with 1,114 square feet. 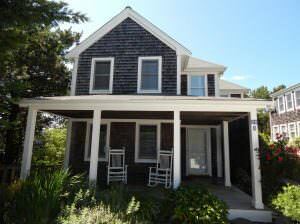 It was marketed at $699K and sold recently for $685K, This condo is an excellent example of the mid market here in Provincetown. Remarks: You’ll enjoy spacious townhouse living in this centrally located condominium. This immaculate home boasts an open floor plan living/dining/kitchen area with newly refinished hardwood floors, a wood-burning fireplace, and a half bath, all on the 1st level. On the 2nd floor, the oversized master bedroom has vaulted ceilings, exposed beams, 2 large closets and a bathroom with a jacuzzi tub and a separate shower. Also upstairs, a 2nd bedroom and a 2nd full bathroom. All baths were recently renovated. Use the unfinished basement for storage or create even more living space by finishing it. The exclusive use covered porch surrounded by beach grasses and flowers offers a lovely spot for relaxing or cooking out. CAC, 2 parking, pets for owners and weekly rentals permitted. Lovingly maintained.